A completely portable and rechargeable handpiece. High capacity lithium-ion battery provides stable and prolonged usage. Also Changeable. Powered by the finest Swiss-made motor, Micromax features an ergonomic design that is comfortable to hold and easy to use. Heavy-duty, high-torque, brushless motor with fingertip control provides consistent, smooth, quiet operation and resists stalling under load, even at slow speeds. 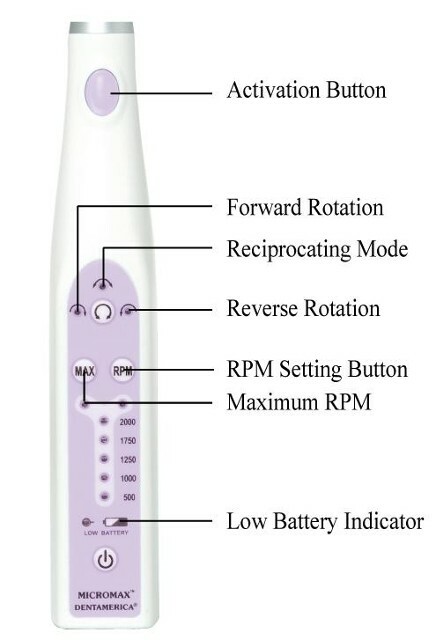 Five pre-set rotation speeds and forward/reverse functions maximize versatility. Reciprocating mode turns ANY prophy angle into a reciprocating angle to reduce heat build-up and splatter—no additional attachment needed. High capacity lithium-ion battery provides stable, long lasting performance. Operates for two hours continuously on a full charge. Total weight only 4.8 oz. 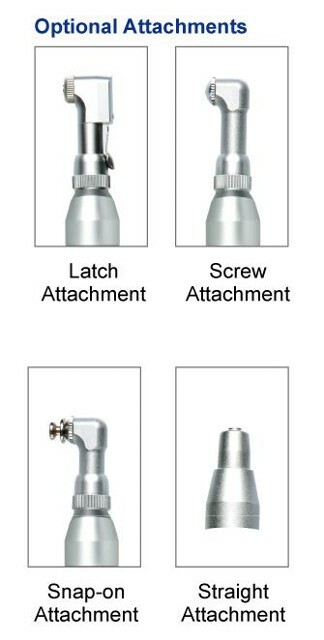 Each handpiece is complete with your choice of latch, screw, snap-on or straight-type attachment, and 110VAC charging base with built-in status indicator. Manufactured under strict ISO 9001 guidelines, Micromax offers a one year manufacturer's warranty. Includes charging storage base.